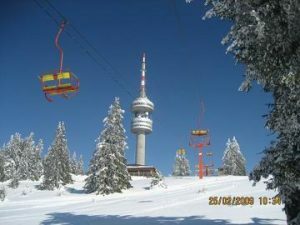 Pamporovo is the largest resort of the Rhodopes. It is located 260 km from Sofia and 85 km from Plovdiv, it has an altitude of 1,650 m.
Most trails start from the highest point of the mountain. It is well suited both for beginners and experienced skiers. The ski trails of the resort can be used by snowboarders. There are conditions for rough terrain rides. A half-pipe facility is also available for snowboarders. Early in 2010 Pamporovo hosted Pamporovo Freestyle Open with participants from Bulgaria and other European countries. 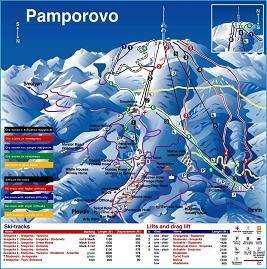 There are several ski schools in Pamporovo for children and adults. The instructors have excellent qualifications and offer ski and snowboard instruction for all levels. Parents can make use of a ski school and a ski kindergarten for their children. The instructors of the major schools speak many foreign languages and the groups are small. This allows an individual approach to the needs of beginners as well as special instruction for skiers and snowboarders who wish to improve their skills. In 2010 travel agency Neilson Active Holidays declared the largest ski school in Pamporovo the best in Europe. There are many restaurants, taverns and hotels in Pamporovo. The restaurants offer traditional Rhodope dishes and also international cuisine. The towns of Chepelare and Smolyan, in close proximity to the resort, offer additional entertainment options. One of the most interesting and unique museums in the country – The Museum of Rhodope Karst – is located in Chepelare. Take a walk to some of the Rhodope villages, such as Shiroka Luka, Momchilovtsi, Solishta and Gela. Shiroka Luka is quite impressive with its houses from the time of the Bulgarian Revival, its traditional taverns and quaint cobblestone streets.